You've probably heard this phrase or a similar one ("down the drain," "down the tubes," etc.) dozens of times during your lifetime when someone has described how their plans or their careers or their finances went awry. It's so common that I found over 13 million links when I "googled" it! My goodness. "Down the terlet" garnered only 9,200+ sites ("IN the terlet" has 24,000+.) That's redneck for toilet, in case you haven't heard it before. No, I'm not going to check again after uploading this entry to see if it's added to the mix; I'd have to wade through too many pages to find it! 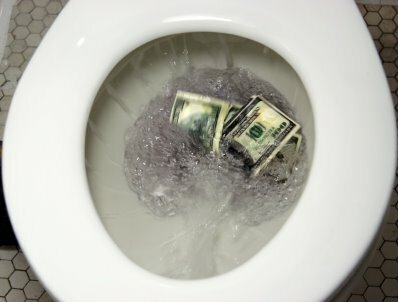 You may as well have flushed real money down the toilet, right? I borrowed that picture from one of the first websites that popped up in my search. You'll soon see why it is relevant. Here's a good laugh for you today, at my expense. It wouldn't seem at all comical to ME if we had to buy a new phone, charger, carrying case, and mobile kit (cord and software for internet connectivity when we are on the road). Fortunately, all I need to buy is a new carrying case for about ten bucks. You can probably see where this is going . . .
We got back to our house in Roanoke recently after being gone in our camper for four months. While restocking the refrigerator and pantry at Wal-Mart one day, I had to use the bathroom. It's been long enough since I've been in this particular store that I forgot the toilets automatically flush when you stand up. In case you haven't noticed, some of these commercial suckers flush MUCH more powerfully than your standard porcelain throne at home! My cell phone case was clipped to the waistline of my shorts. I stood up, turned around and bent over a bit to flush the toilet, and GOOD GRIEF, not only did the case slide right off my waistband, it fell into the potty -- just as the self-flusher activated itself! My cell phone was history faster than anyone could possibly react. Vanished. Small enough (including case) that it didn't back up the drain pipe or float back up into the bowl. Nope. Totally outa sight and several blocks away before I could blink an eye. I stood there kind of dumb-founded for a few seconds, amazed at how fast it happened. It took another few seconds to know with certainty that the phone was gone forever. I kind of laughed at the sick humor of it, but quickly sobered up when I realized it might cost a couple hundred dollars to replace the phone and all the accessories mentioned above. I used a land line in customer service to let Jim know what happened but had to leave a message when he didn't answer the strange number he saw on his cell phone. I didn't tell him exactly what happened, though; there were people within earshot and I was, um, embarrassed. Surely no one ELSE has ever done something this careless! When I was done shopping at Wal-Mart, I called Jim again from the nearby Verizon store to see if he wanted to meet me there to buy a new phone. I did tell an employee at Verizon what had happened, wondering what she'd think of me, and she said she's definitely heard that story before. That made me feel a little better -- I'm not the only one! Anyway, when I got home about 90 minutes later, Jim had not only found the older phone (just like the one I flushed), he had also called Verizon to get it activated with my number and had all my stored numbers transferred to the "new" old phone from our computer. What a guy! The customer service gal he talked to on the phone also confirmed that "down the toilet" is a very common way to lose a cell phone. Well . . . I've also searched the internet for "cell phones down the toilet" and you'd be amazed at what a popular way this is to lose phones! Google found over 400,000 links for that. Some are tricks like using rice to dry out a wet cell phone that's been retrieved from a toilet (bathtub, sink, creek, etc.). Some give plumbing tips when the gadgets get stuck somewhere down the line. Some are articles about how often cell phones end up in toilets and funny related stories. Some are blogs with personal experiences like mine. The title of this article on cellularnews.com written in June, 2007 caught my eye: "Brits Drop 850,000 Phones Down the Toilet -- Each Year." Wow. Think how many more have gone down the loo since then! Many people go to the bathroom with their cell phones. And sometimes, the phone ends up answering the call of nature. David Toledo of Miami came face to face with this situation, so to speak. On a flight to a meeting with a client in Denver, the telecommunications worker made a pit stop in the airplane bathroom. He flushed, stood up, pulled up his pants � and dislodged his BlackBerry into the dyed-blue swirling liquid. He went in after it. "It was kinda gross afterward, but I had no choice," Taylor said. He gamely washed it, toweled it off, and later was even able to call his wife. It was only after shaking the clients' hands that he got an inquisitive look: "What's going on with your face? You have this blue streak going across it." There are untold numbers of cell-phone-to-toilet encounters every year. There are thousands that reportedly get stuck in sewage systems. And, according to a BBC News report in October, a man aboard a train in France trying to retrieve his downed cell phone lost the battle with the commode's suction system. Hours later, emergency workers reportedly removed the entire toilet, still attached to his arm. Customers whose phones suffer some form of water damage are commonplace, says Frank Bennett, chief operating officer of Simplexity, an online wireless phone reseller. Customers calling or writing in with damaged phones don't always fess up to their toilet encounters. But some do. "Besides people's dogs eating them and getting washed in the washing machine, it happens quite often," said Bennett, who readily admits he has dropped two phones in the bowl himself � and fished them out. People use larger phones with screens and keyboards now, so fewer of them get flushed all the way down, Bennett said. And since they're expensive � smart phones can run up to $500 a device � people are buying insurance for phones in greater numbers. However, most insurance policies don't insure against toilet drops. Setting aside whether it's socially acceptable to talk on the phone in the john, dropping one there is usually considered "negligent" by the insurance companies, according to Bennett. Case in point: Bennett recently talked to a woman who was in a portable outhouse changing her son's diaper when her phone dived in. She saw it, but wasn't willing to retrieve it. Understandable? Totally. Insurable? Probably not. "So it was in this interesting legal status of not being actually lost, but being unretrievable," Bennett explained. Lacking insurance for his smart phone, Washington Post Baghdad correspondent Ernesto Londono managed to resuscitate his by drying it out in a bed of rice for several days. "Very, very slowly, it sprang back to life," he said. The rescue effort was mission critical, he said. In addition to keeping some vital work-related information in the phone, it was the only place he had the phone number of a new love interest. It worked. At least for six months, Londono said. "Which, unfortunately, was more than the relationship." Although that's the first time I've lost or damaged a cell phone, it's a miracle I haven't had as much bad luck with phones as I've had with cameras. Little, smooth, ergonomic cameras are the worst for me. 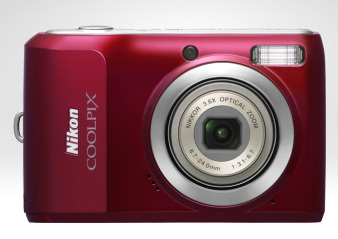 I often carry a compact digital camera when I'm running or hiking. I always carry one when I'm playing tourist somewhere new. I just love to take pictures so my camera is almost an extension of me. Too often, however, I'm distracted or clumsy and simply don't hold tightly onto a camera like I should. I cannot tell you how many times I've dropped one, usually onto something hard like tile or pavement or a rock. I should always wrap the little strap around my wrist but I frequently forget to do that. And the cameras never seems to be in their padded cases when I drop them. There have been several casualties like this over the years, even before digital cameras came out. I've destroyed at least two cameras over the years by leaving them on the bumper or windshield (where the wipers go) of vehicles after I've been running. I wrote last spring about the most recent incident like that when Jim spotted my banged up camera two miles down the road after it bounced off the hood onto the pavement and/or a big rock. That one was in its pouch but it was still DOA. And now you know why I always buy relatively inexpensive cameras! The true miracle here is that we are still occasionally using the Nikon Coolpix 4100 camera that survived the entire Appalachian Trail Adventure Run in 2005 -- despite all the falls I took during that 2,175-mile journey run and going through rain and high humidity for 4+ months, sleet on top of Mt. Madison, flooded streams in Maine, and more. It's the camera Jim uses when he occasionally agrees to take pictures on his runs, and the one that tides me over for a few days when I've ruined my latest camera and have to choose another potential victim for abuse . . . I betcha there are some great stories out there about the misadventures people have had with their cell phones, cameras, and the myriad of other little electronic gadgets that are just so doggone hard to hold on to! Since I seem to (too) often serve as a warning to others, consider yourself warned about cell phones around toilets. Remember that you don't even have to be using the phone to drop it in the water. Oh, and if you're as frugal as Jim and I are and choose not to carry cell phone (or camera) replacement insurance for little catastrophes like these -- and because insurance may not even cover such incidents -- be sure to keep your old phones (and cameras) when upgrading to new ones periodically. You never know when you might need them again! OK, that's the end of my toilet humor . . . maybe.